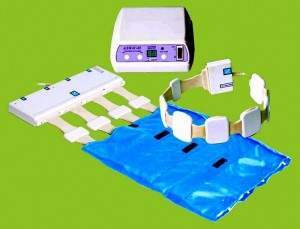 In the treatment of the magnetic field (magnetic therapy) on the patient operate to a constant, a variable, a pulsating pulse, as well as running or rotating magnetic field. These magnetic fields, in contrast to high, don’t have thermal action on the patient’s. With rare exceptions (e.g., iron oxides containing Hb) molecules of biological tissue are weak paramagnetic or diamagnetic. They don’t get in the applied magnetic field detectable magnetic moment, so in the frequency range from zero to tens of kHz magnetic field penetrates into the body without distortion. Magnetic field decay with distance from its source in the tissue has the same character as in free space, and is proportional to the square of the distance from the source. The main parameter that characterizes biotropic and other action of a magnetic field is the Magnetic Induction (in the Western literature, this quantity is often called the Magnetic Flux Density, which is more accurately reflects its physical nature). The unit of magnetic flux density is the Tesla or more likely to use a thousandth of a Tesla – milliTesla. Sometimes in the literature. As the unit of measurement of the magnetic field, uses gauss, equal to one tenth of MilliTesla. The static magnetic field of the Earth is about 0.05 mT, utility rooms usually in the 100 – 1000 times smaller. The sources of the magnetic field using permanent magnets that generate magnetic fields of tens mTesla, coils with ferromagnetic cores, coreless coils (solenoids or ring circuits with electrical shock). Magnetic components to produce the most powerful permanent and variable magnetic fields up to hundreds mTesla and more. Solenoids (ring circuits) usually use a diameter that is placed in the lower limb or torso. Due to technical limitations (required power supply, cooling conditions, etc. ), the magnetic field in the solenoid rarely exceed a few units mTesla. In the basic of the therapeutic action of magnetic fields are known physical laws. When a conductor (e.g., blood in a vessel) is moving in an inhomogeneous static magnetic field, or on a fixed biological structures (muscle, nerve cells) operates a time-varying magnetic field, there, according to Faraday’s law of electromagnetic induction, are induced electromotive force and thus, ring currents. The density of these currents is determined by the rate of change of the magnetic field (the movement of the conductor in an inhomogeneous static magnetic field) and the electrical conductivity of tissue. This phenomenon makes it possible, in particular, non-contact electrical stimulation of muscles. Electrical conductivity of tissue, depending on the chemical composition, varies in a very wide range and maximum values reached in the cerebrospinal fluid and blood serum. The most effective and cheapest are the devices, such as Almag-1 and Magofon, and Almag-2 and Polimag. If Almag-2 and Polimag intended mainly for medical offices and hospitals, the Almag-1 and Magofon have been successfully used in the home. Mavit device uses for the treatment prostate and operates, besides PEMF, also by heat and vibration.